I would like to say that the day started off like any other, but it certainly did not. It was Sunday, and I woke up around 8:45 am. I knew we needed to leave by 10:30 to get to church on time. I made a big mistake that day, I decided to go back to sleep. I remember NOT wanting to get up. I stayed in bed for another hour or so, then made coffee, as I began to start my day. I heard my dad yell “We missed church!” He was somewhat upset, and told me he thought it was 10:00 – instead of 11:00. I’ll regret my lousy decision to procrastinate for the rest of my life. Little did I know then, but I would need that sermon later in the day. We went to our favorite restaurant in Joplin. The Colonels is a family owned business with the best breakfast in town. Then we went grocery shopping, I’ll never forget talking to a lady in the parking lot. She gave us her shopping cart shortly after we got out of the car. She was persistent in asking for her quarter back (anyone familiar with Aldi’s knows how the quarter thing works). So my dad went to the car and gave her a quarter, and we chatted. She was such a nice lady. God bless her in whatever happened to her that day. We got home and unloaded the car. It was around 2:00 pm, and I remember feeling uneasy that day. I had seen better days, and remember not doing anything I had planned. I decided to take a shower. As I got ready, I did so with my headphones on full blast. I still remember the last song I was listening to when my dad said, “Trey we are under a tornado watch.” I didn’t care the least bit. About two or three minutes later, our bathroom lights flickered. I still wasn’t taking this seriously. Little did I know a tornado was tearing our city apart. My father and I went into the garage to make room to bring the car in. When we got the space cleared, he went outside to look around. Our neighbor across the street yelled, “There’s a tornado on 20th and Rangline, and its tearing up the whole town!” We left the garage and went to look through our patio doors. Looking into our backyard, the sky was turning a dark greenish black. Winds had picked up to major speeds. I asked my dad, “What are we going to do?” He then told me to get a blanket and pillow. So I went to my room and grabbed them, then went back to the patio doors where my dad was still watching. We started to see debris flying in the air. I pointed in the sky and asked, “Dad is that it?” with panic in my voice. He said, “No, I think that’s it, and pointed into another direction. Little did we know at the time, but we were both right. This massive tornado was one mile wide! Our dog, Rosie, started nipping at my fathers shoes, acting really nervous, which was strange behavior for her. I didn’t realize until later that she was warning us of danger. The next thing I remember is asking my dad why he was so calm, I didn’t understand it. I could hear the wind outside picking up speed. I was pleading with my dad to come into the bathroom. “Dad, please, let’s take cover! !” More debris filled the air. Winds began to howl. “It might have just passed over us,” he said. I didn’t believe it, because conditions were getting worse. “Dad, come on! PLEASE! !” I was now begging. But he was taking pictures! I remember telling him he had plenty of time for pictures later, but to please come with me for safety. Then our other dog, Elvis, ran outside through the doggie door. My dad screamed, “ELVIS!” As we opened the patio door to grab him, we felt the aggressive winds push us back. It was then that we saw our neighbor’s house get caught in the tornado. My dad said, “TREY GET IN THE BATHROOM!” We ran so fast we couldn’t get our dogs in there with us. My bedroom window busted out and we both knew we were next in line to get hit. As my dad shut the bathroom door, I told him I loved him. He said it back, but he didn’t tell me that things were going to be okay like he usually did. He had seen the neighbor’s house get torn apart, but I had only seen the debris in the air. I immediately began to pray for protection for me and my dad, and for our beloved dogs, which I thought were being taken away. I was so terrified. As I was praying out loud, I began to think about my life recently, about my friends, our neighbors, things I wish I would have gotten the chance to do, my grandmother, my mom. I knew they had no idea what was happening to me right now. Right after I began praying, our patio doors blew in completely. I heard a massive gush of wind enter the house, and glass breaking everywhere. Wood was tearing in half, our roof was shaking back and forth, I heard the sound of walls falling down, and a suction-like sound. The howling of the tornado was so loud, I could barely hear my father telling me he loved me. I started quoting scripture. “A thousand shall fall at your side, and ten thousand at your right hand; but it shall not come near you” Psalms 91:7. I could actually hear my grandmother saying that to me. She had quoted that scripture to me during my last visit with her. My dad was struggling to hold the bathroom door shut, and he was telling me he couldn’t hold it anymore. At that exact moment, the vanity drawer in the bathroom slid out and lodged against it, helping him hold the door. I told him, “God is protecting us! It’s going to be okay Dad, It’s going to be okay!” Little did I realize it, but God had his hand over us the whole time. Things calmed down for a little bit, and Dad said, “Trey, look at the roof! It’s gone! Trey, look! Trey, look!” I told him, “No Dad, don’t look at the storm!” Then another wave came, with even more powerful winds. The first layer of our bathroom window shattered, and the whole foundation of the house shook. But the difference this time was that, I knew I was protected, and God wouldn’t let anything happen to me. I was secure in God’s word. When it was over, a death-like silence surrounded us. Neither of us said a word. Not a sound was heard. Then my dad said, “Are you okay?” Yeah, I told him. We opened the bathroom door and saw the destruction of our home. Our dining room was an open space, like the outdoors. Our living room had fallen in on itself. I began to go into shock. I couldn’t believe it. This doesn’t happen, at least not to me. No, this didn’t happen. We went into my room and Rosie came out from beneath my bed. “Rosie! !” I was so happy to see her. My beloved dog, I thought I had lost her forever, but God saved her. She was so happy to see us. She did her little dance of excitement. She knew our lives had been threatened. But we were still missing our other dog, Elvis. When I stood up from petting her, I saw the complete destruction through what used to be my windows, but was now just a square in the wall. Complete devastation. My neighborhood I had grown so fond of. The streets I had walked almost daily, now looked like a bomb had went off. Debris was everywhere you looked. Some homes just had foundation left. Looking at what was left of one of my best friend’s house across the street, I felt for certain he must be dead. I was so devastated, thinking about how I took our friendship for granted. How I could have been a better person to him. Tears streamed down my face like a river. My life was changed for ever. I ran and grabbed my phone from the bathroom and called my grandma. It never crossed my mind that the power lines had been knocked out. Through a miracle of God, the call went through. My grandfather answered, and I was so in shock and panic mode, I could hardly speak. Grandma got on the phone, and I told her what was happening, asking for prayer. My grandma immediately sent a prayer chain out all over Oklahoma City, and through Kenneth Copland ministries. That proved to be the last call I would get to go through – until we got outside the area of destruction. 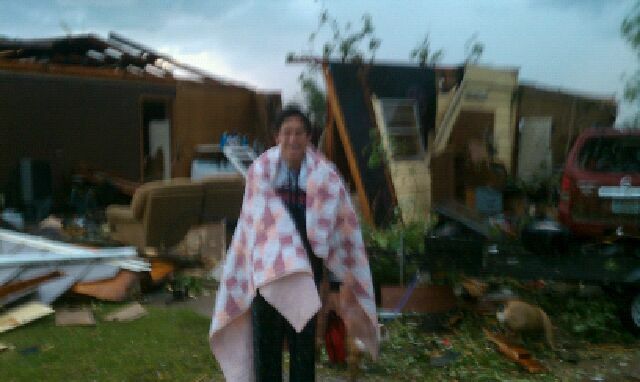 My dad and I wanted to get outside to help our neighbors, but it was a struggle to get through the debris of our home. When we finally got outside, it really hit me. I saw what was left of my home, my friend Collin’s home, and my other neighbors. I was praying they had made it. We saw someone come from around their house and yelled, “Are you guys okay?” “Yeah,” my dad yelled back. “Have you found anyone?” he asked. “No, we just left our house, is everyone okay?” “I don’t know” he replied. As my dad began to pull people out of the debris, Collin’s family was still on my mind. When I ran over there to see, I saw his grandma was coming out of what was left of their home. She ran to me and hugged me. “Trey I’m so glad you made it!” she said. “Thank you, I’m glad you’re alive too. Where’s Collin?” She told me he had stayed at a friend’s. I was so relieved. After we found as many people as possible in the rubble, about 10 to 15 of us gathered together at a home that hadn’t been too damaged, to try and figure out what to do next. My dad and I went on a search for Elvis. It wasn’t long until I found him in the living room, far away from where I’d last seen him. He was huddled under the computer desk, but safe and unharmed. God had saved his life too. I was very thankful that every living creature in my house survived. Then I saw my hamster crawling around. “Dad, look!” I said. His cage had been destroyed, so I put him in a box, and we went back to the neighbor’s house. It was a long night after this. We spent it helping people and waiting to be rescued. The rain poured down hard, and didn’t stop that night. We were all bunched together in the best home standing, but so thankful to be alive. God not only saved my life, but my father’s, my dogs – Rosie and Elvis, my hamster, along with the neighbors I had grown close to. Eight people died in my neighborhood that day, and as their family and friends kept coming up to us asking if we had seen this or that person, I prayed for each of them. I have never been so thankful to be alive as I was on May 22nd 2011. Thank you, God. This entry was posted on Thursday, July 12th, 2012 at 9:07 am	and is filed under Dreams / Visions / Words. You can follow any responses to this entry through the RSS 2.0 feed. You can leave a response, or trackback from your own site. You ought to take part in a contest for one of the best sites on the internet. I will recommend this blog!